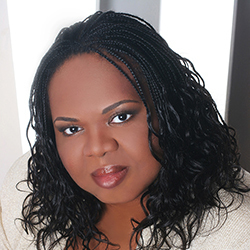 Tennessee-native contralto Gwendolyn Brown earned a bachelor's degree in music from Nashville's Fisk University and began studies for a master's in vocal performance at the University of Memphis, completing it at the American Conservatory of Music in Indiana. Afterwards, she continued honing her voice in the Des Moines Metro Opera Young Artist Program and at the Ryan Opera Center of the Lyric Opera of Chicago, and she has since appeared with many opera companies in the United States as well as in Germany, Italy, Spain, Belgium, and the Netherlands. Brown recently appeared as Azalia in William Grant Still's Troubled Island with the South Shore Opera Company, the first group to perform the work with an all-black cast as the composer intended since its 1949 premiere. She has also recently created two leading roles: the title character of Ethan Gans-Morse's The Canticle of the Black Madonna and, with the Los Angeles opera company The Industry, Marie Laveau in Anne LeBaron's Crescent City. Brown earned critical acclaim for her portrayal of Maria in Gershwin's Porgy and Bess with the Washington National Opera, Seattle Opera, and New Orleans Opera, as well as the Boston Symphony Orchestra and several companies overseas. Her credits also include covering Queenie for productions of Show Boat at the Lyric Opera of Chicago and Washington National Opera, where she took the stage for two performances, as well as performing several Wagnerian roles -- including Fricka in Das Rheingold, Waltraute and the First Norn in Gollerdiimmerung, and Erda in both Das Rheingold and Siegfried -- and appearing as Baba in Menotti's The Medium, Kabanicha in Janacek's Ka1'aKabanova, and Filippyevna in Tchaikovsky's Yevgeny Onegin. She was a featured soloist during the Chicago Symphony Orchestra's 2009 “Beyond the Score” focus on Dvorak's ''New World" Symphony.